Jakarta (VNA) – A Vietnamese delegation led by Deputy Minister of Foreign Affairs To Anh Dung attended the High-Level Dialogue on Indo-Pacific Cooperation in Jakarta, Indonesia, on March 20. The event saw the presence of foreign ministers and senior officials from 10 ASEAN nations and its eight partner countries, namely Australia, China, India, Japan, the Republic of Korea, New Zealand, Russia and the US, along with representatives of some South Pacific countries. Themed "Towards a Peaceful, Prosperous, and Inclusive Region," the dialogue offered an opportunity for the countries to exchange cooperation initiatives in the Indo-Pacific region and seek win-win partnerships. 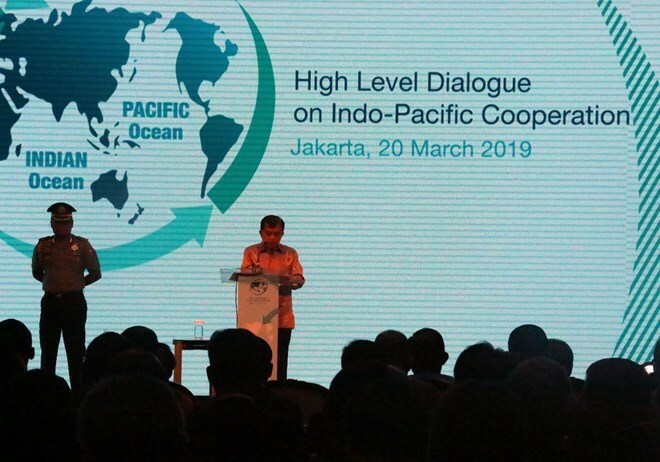 Indonesian Vice President Jusuf Kalla emphasised that building the Indo-Pacific into a peaceful, stable, cooperative, and prosperous region has significant meaning not only for countries in the region but also others beyond. Indonesia proposed the countries focus on three priority fields, namely marine cooperation, infrastructure and connectivity, and sustainable development. At the discussion on March 20 morning, representatives of the 10 ASEAN countries and the eight partner countries presented their views on cooperation in the Indio-Pacific region, as well as suggested orientations and measures to boost collaboration. Deputy Minister of Foreign Affairs To Anh Dung called on the countries to join hands to realise the target of building a peaceful, stable, cooperative, developed, and prosperous Indo-Pacific region. The diplomat recommended taking peace, stability and prosperity as the common goal while respecting independence, sovereignty, and self-determination right of the countries.